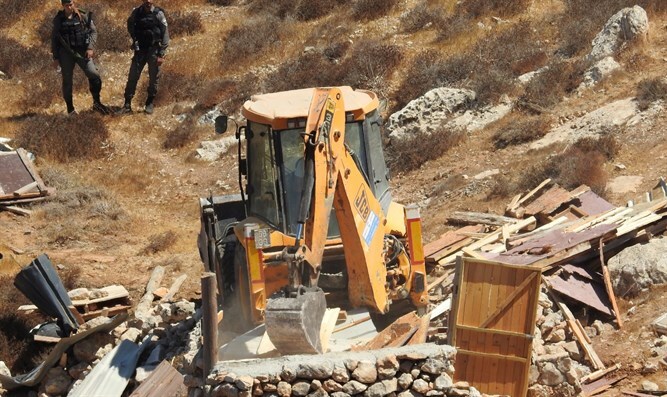 The Defense Ministry’s Civil Administration demolished a home in the Israeli town of Mitzpeh Eshtemoa south of Hevron in Judea, Thursday morning. The home belonged to Ariel Hiller, a former resident of the town of Netzarim, one of 21 Israeli towns in the Gaza Strip that was evacuated during the 2005 Gaza Disengagement. In 2014, Hiller built his new home on state land in Mitzpeh Eshtemoa. But recently, Civil Administration officials warned the house faced demolition, claiming it was built without proper the necessary permits. But officials from the Hevron Hills Regional Council say Thursday’s demolition came as a surprise, claiming that the Civil Administration had told them it would delay the eviction. Local officials also noted the discrepancy in how the administration handles Jewish homes built with authorization from the regional council but without Civil Administration building permits as compared to wildcat outposts constructed by Arabs or illegal homes in existing Arab communities. “There’s terrible discrimination going on here; at a time when the Israeli government is talking about expanding and strengthening [Jewish] settlements, in the field there are thousands of illegal [Arab] homes being built by the Palestinian Authority and [with the help] of European [organizations],” said Hevron Hills Regional Council chief Yochai Damari. “At the same time, [the government] is legalizing [these Arab] homes and drawing up plans for Palestinian construction in Area C,” which is under full Israeli control.